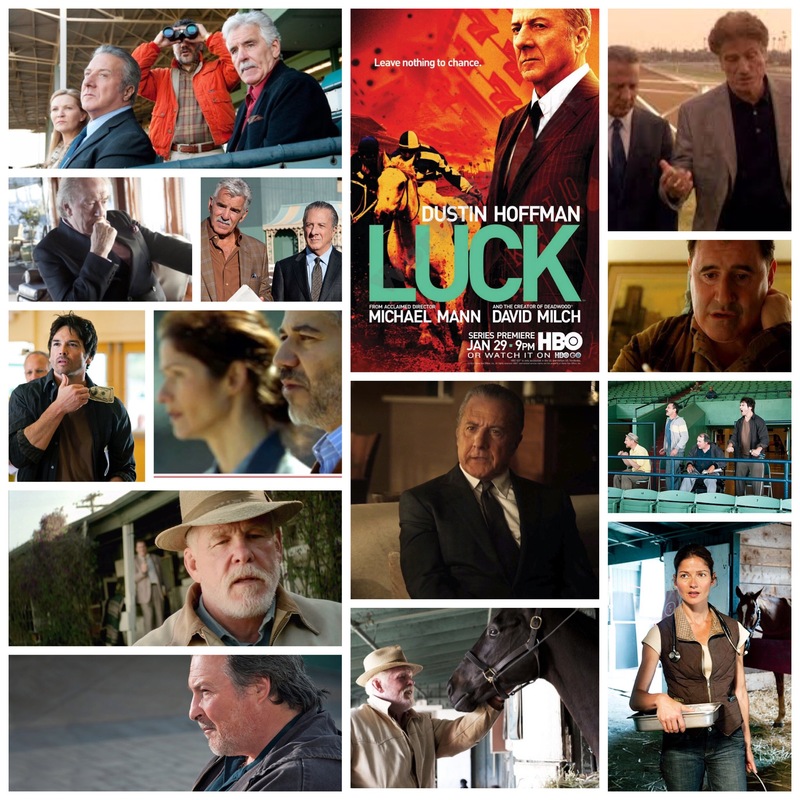 Michael Mann’s Luck was a painfully short lived HBO original series with reach-for-the-stars potential, a mind blowing cast and a terse, eccentric script from David Milch, all fuelling a brilliant ensemble storyline set in a pristine Los Angeles horse racing track. I’ll get the elephant out of the room right away: the series was cancelled due to a few of the horses dying on set, for whatever reasons. Had it been allowed to continue though, I imagine it would have gone on to become one of the network’s, and Mann’s, most hallowed and heralded works. Dustin Hoffman is the centrepiece of the cast as Chester ‘Ace’ Bernstein, a sharp witted Jewish mobster who’s recent stretch in the joint has somewhat dulled his edge. Nevertheless, he slyly takes a stab at playing his hand with horse ownership, joined by his charismatic driver Gus (Dennis Farina, reliably wonderful). There’s all kinds of other hoopla going on, and it’s cool to see the story focus on both the upper crust elite doing their shady deals as well as everyday joes tossing their money into these worshipped games. Kevin Dunn is terrific as a disabled firebrand of a gambler, joined by his two scrappy pals (Ritchie Koster and Jason Gedrick) as they try out their own brand of luck. Jill Hennessy is a determined horse trainer who clashes with a belligerent owner (Yul Vasquez), and there’s two ominous crime kingpins played by Michael Gambon and Ted Levine who hover in the shadows as well. Further still is a heartbreaking turn from Richard ‘Bing Bong’ Kind as a stressed out jockey manager, Nick Nolte as a crusty, broken-down horse trainer, Joan Allen, Alan Rosenberg, Spencer Garrett, Don Harvey, Ian Hart, W. Earl Brown, Shaun Toub, Bruce Davison, Frank Collison, Mercedes Rhuel, Tony Curran and a cameo from Jurgen Pröchnow as the stern owner of the whole track. How’s that for a cast. I must say that the dense, peculiar dialogue from Milch takes some time getting used to, but once you tune in to it’s jive, it’s pure poetry being rattled off by every character, and a gorgeously structured, meticulously layered script at that. The actors are all on a plane of pure excellence as well, many of them turning in career best efforts and bringing their roles vividly to life. The cinematography from various artists is pure spun gold too, every sparkling irrigation sprinkler, glistening horse coat, careful closeup and crop of dirt kicked up by hooves captured succinctly and smoothly. This seriously is as near to a perfect season of television as one can get, and it kills me that it got cut down before it had a chance to really get going, because just think of the places it could have gone. At least we still have this first glorious season to admire, and I recommend every minute of it.